Van Snyder went to visit the IBM museum in Sindelfingen, Germany. He took some lovely pictures, https://picasaweb.google.com/111372799358534121266/SidelfingenHzG2011. If this doesn't work, try http://picasaweb.google.com/wvsnyder and click on "Sidelfingen HzG 2011". Of special interest is a display of IBM's standard "gate" for SMS cards. Card side The card side of IBM Standard "Gate". It is 24 card slots wide by 6 card slots high. A few card slots are used to get power and logic connections into the rack. Wire Side The wire side of IBM Standard "Gate". The bare wire ends are wrapped around rather sharp rectangular contacts making a "gas tight" metal-to-metal contact. The automated wire wrap machines were made by Gardner-Denver. The white rectangles with many holes are movable guides to aid the trouble-shooter in finding the desired card and connection. Very nice site you have! Perhaps you can help me. with a description of their function and perhaps components. Do you know where I can find this information? What are you doing with SMS cards? Anything we can help with?? Depends on what you have and want to know about. 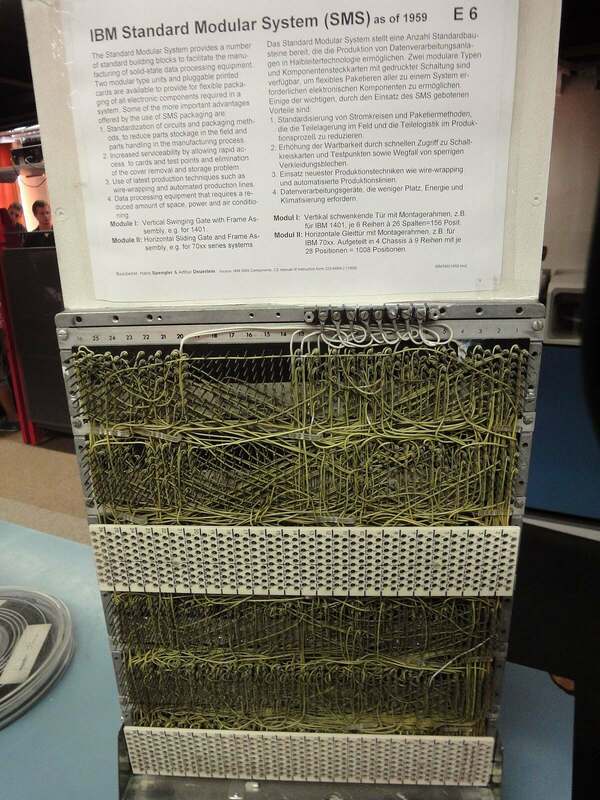 IBM had several THOUSAND different types of SMS cards used in a very wide variety of equipment. Logic families included RTL, DTL, and ECL (although IBM had different names for them); Analog cards came in a very wide variety including amplifiers, current sources, voltage regulators, and high power drivers; many cards were just "resistor packs" or other assortments of misc components. Some cards contained core memory planes or ferrite pulse transformers. Most cards were single wide. we have some double wide cards in the 1401, I have seen a photo of a card used in the 7030 Stretch that was five or six wide (I don't recall exactly right now). Most cards simply plug into the socket(s) but some cards had attached cables that had to be connected somewhere else. Most SMS cards run on 2 to 4 different power supply voltages (typically +12V, -12V, +6V, -6V), but some need other voltages and most Logic cards use at least one "Margin check" voltage. The cards were used over the period of 1959 through about 1971. Over this period the circuits on SMS cards evolved from discrete transistors on the early cards to Solid Logic Technology hybrid integrated circuits on some late cards. I very much doubt there is anything approaching a complete list of SMS cards anywhere. Our sources of information have been schematics for the IBM 1620 (RTL Logic and misc Analog), IBM 1401 (DTL Logic and misc Analog), IBM 729 tape drives (mostly Analog), IBM 29 keypunch (mostly "diode packs") and some IBM training manuals documenting a few ECL Logic cards. SMS card types are designated by a 2 to 4 character code, mostly alphabetic (e.g., MX, CD, ADB, JPH, CQZT, 4JMX). The numbers designate drawing numbers and ECO numbers.